What did I expect? A tense, intelligent study of extreme motherhood. What did I get? Better than expected and yet not as good as it seems, The Sugarland Express provides early evidence of Steven Spielberg’s otherworldly filmmaking skills while evincing a prosaic, boilerplate maturity that, for most of his career, Spielberg instinctively shunned. If Sugarland bafflingly fails to resonate as it ought, it may be because Spielberg’s impersonation of a cooler, more measured director was an iffy fit all along. 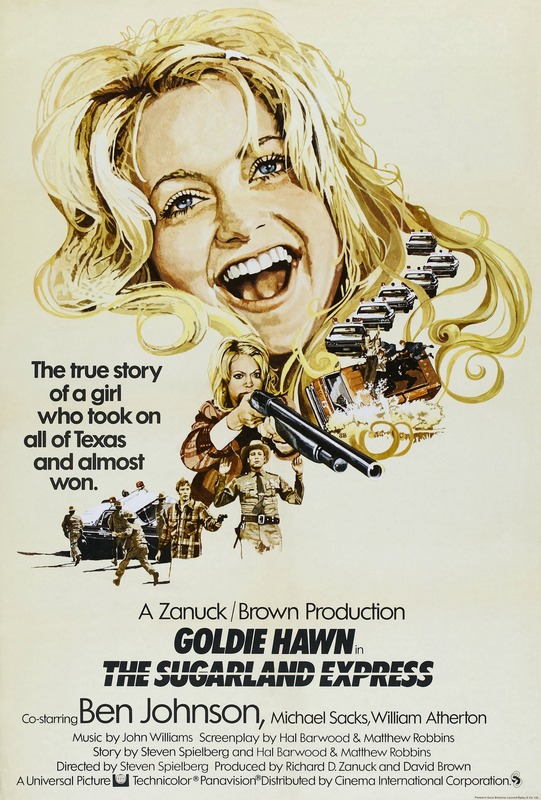 Based on an actual incident that took place five years before the movie’s release, The Sugarland Express covers the day or two after Lou Jean Poplin breaks her husband Clovis out of prison for the purpose of rescuing their infant son Langston from the upper-middle-class (of course) foster parents to which the government authorities have assigned him. In short order, the good Poplins, having taken control of young patrolman Maxwell Slide’s police cruiser, spend the rest of the movie in an improbably winsome flight from the authorities. A viewer encountering the movie for the first time is likely to be impressed by Spielberg’s unfussily convincing (and not very condescending) re-creation of rural Texas life; even the Modesto, California, that Lucas conjured for American Graffiti is not quite so well realized. Every so often an elegant bit of business calls to mind the storytelling of Spielberg’s later masterpieces. This is the one Spielberg movie that truly fits the gritty, naturalistic American cinema of the early 1970s, which hindsight allows us to sense Spielberg’s inchoate yearning to transcend. The inherently private stakes of a hostage situation are soon transmuted into an amusingly public convoy of fifty or so police cars, the “express” of the title, a strategy designed to repress the depressing fate the Poplins, now having committed serious felonies, face. In an unwitting gloss on the yet-to-be-popularized term “Stockholm Syndrome,” Lou Jean, Clovis, and Patrolman Slide become positively chummy under the increasingly unlikely threat of Clovis’s armed response. The Sugarland Express is a sunnier version of both Bonnie and Clyde and The Getaway, which adds up to a tough assignment. Lacking Peckinpah’s cunning heartlessness and Arthur Penn’s insouciant interest in myth, Spielberg loads the deck in favor of — well, just about everyone in the movie. The movie’s principal actors are all vivid and piquant, although the trio of young actors are all probably too nice for the roles they’re playing, from Goldie Hawn and William Atherton as the Poplins to Michael Sacks as Patrolman Slide. (Atherton would become a 1980s staple as a sourpuss in Ghostbusters, Real Genius, and Die Hard.) The performance that anchors the movie is that of Ben Johnson as Captain Harlin Tanner, as resonant an advertisement for manly Texas values as you’re likely to find. Johnson’s Tanner is a rich portrait of reluctant authority, so unfailingly appealing and wise that Spielberg probably regarded him as his own ego ideal. The Sugarland Express is a quality entertainment, but it doesn’t stick with you. Spielberg is renowned for delivering the undiluted emotional responses of his characters, but in Sugarland the characters are a touch too one-dimensional to register, a casualty of the persistent inertness of the emotions at the movie’s core. What here smacks of 1974? The look and feel, mainly.